Umbrella in hand, Deacon David Waters eased into a relieved smile. 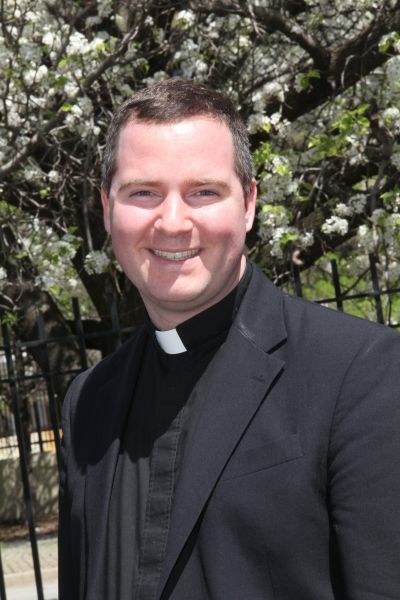 About a month from priestly ordination for the Archdiocese of Philadelphia and numerous pages from completion of his master’s degree thesis, Waters sunk into a tan easy chair and exhaled. Minutes before, Waters sat around a table at St. Charles Borromeo Seminary in jovial discussion with the school’s library staff amid cheesesteaks, taking a pause from working on his paper. His writing continued despite the eerie, near-vacant feel of the seminary during academic breaks such as Holy Week in which only the library remains open. A sense of accomplishment projected from his persona as he sported a black T-shirt and tan shorts and took a break from the hectic Holy Week schedule at his diaconate assignment, St. Patrick Parish in Norristown, and seminary responsibilities including long hours of academics. Thirteen pages down, seemingly countless to go. Lewis Temple, a man of the Jewish faith and Waters’ friend since middle school in western Chester County, said the deacon, who’ll often break into a high laugh, also has a serious side in which life — including a scholarly approach to the Catholic faith — is no joke. Temple recently attempted reading Homer’s “Iliad.” Like the average reader, he found the epic frustratingly difficult to undertake, but he’s sure Waters would find it a natural read. Though Waters and Temple, who recently started identifying with his Jewish faith, are believers in different religious traditions, they didn’t let differences get in the way of their friendship. Both openly approached discussions and Temple, who lives in Houston, plans to attend Waters’ first Mass this May. Deacon Waters proclaims the Gospel during the Chrism Mass April 17 at the Cathedral Basilica of SS. Peter and Paul, Philadelphia. Even as kids after sleepovers, intellectual matters would occupy discussion on morning walks in addition to movies and other subjects. Topics could change from astronomy and black holes to jokes. Receiving a full scholarship to the University of Pennsylvania at the close of his years at Downingtown High School East, Waters opted to attend the seminary instead, though some opposed his decision. A near-death experience with appendicitis, coupled with his grandmother’s passing, brought Waters away from the Catholic faith in his early teens. He started attending Protestant youth groups and churches, including the Methodists, from whom he learned a Biblical style of prayer, lectio divina, often prayed by Catholics and in seminaries. 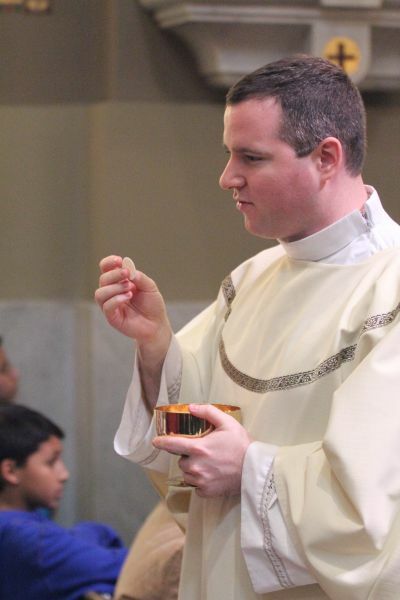 An attraction to the Eucharist brought Waters back to the Catholic faith in high school. He often found himself defending the truth of the Eucharist as the real presence of Christ against some friends, who thought of the consecrated host as merely symbolic. Reading St. Augustine and his plea to church tradition helped ground Waters in Catholic teaching. 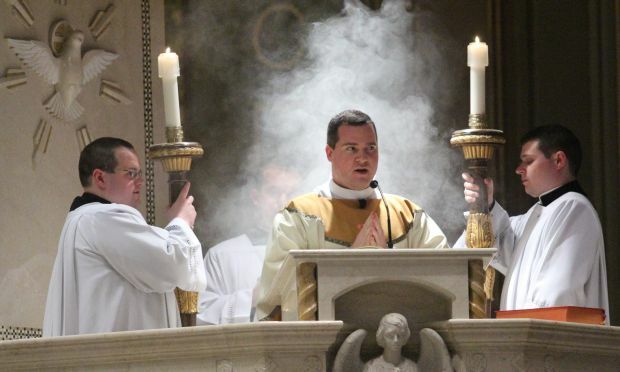 Adoration of the Blessed Sacrament also led to his priestly call, as did Father Peter DiMaria, pastor of Sacred Heart Parish in Royersford, who was an important figure influencing Waters’ vocation. Father DiMaria said he’s known Waters since the candidate’s freshman year of high school. At the time, Father DiMaria was a full-time faculty member at Bishop Shanahan High School in Downingtown with his Sunday assignment in at St. Peter Parish in Honey Brook (now the church is located in West Brandywine), Waters’ home parish. Father DiMaria first spoke to Waters after Sunday Mass. 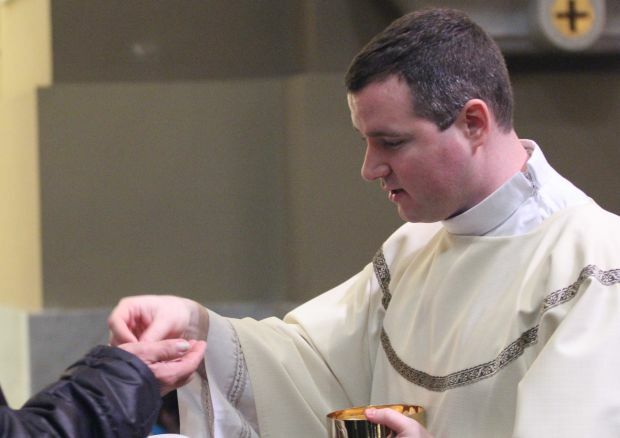 The priest also previously served as chaplain at St. Mary of Providence Center in Elverson, where he asked Waters to serve at the altar for Sunday Mass. Waters never served Mass before in grade school. Matthew Poole, a friend of Waters since sophomore year at Downingtown East, said Waters’ intellectual talents came forward in marching band and Latin class, and he approached his religious discussions with friends in an evangelical yet joyful way. Poole called the soon-to-be-ordained priest an integral person in his conversion from the Lutheran to Catholic faith, which Poole termed a five-year process. Ironically, just months after Waters ordination this upcoming September, Waters will officiate at Poole’s marriage to a Catholic woman. “He was always reaching out to people of all different perspectives,” said Poole, who has known Waters for 10 years. Outgoing and personable are two qualities Poole used to describe Waters and his visible approach to faith. Poole said Waters constantly focused on “the person of Christ through a Catholic lens” in debates. Waters’ voicemail evidenced another of the deacon’s academic proficiencies — his fluency in Spanish, honed this past year through the seminary’s language immersion program and his parish assignment, St. Patrick’s in Norristown, which has a predominant Spanish-speaking population.